It's happening! CKD is diving right into rugs. I could not be more excited to start working with a new surface. My full-time job in nyc was working in the rug department creating custom rugs for Holland & Sherry. I applied to the job thinking, "rugs?". Now the dots have connected, and I am once again amazed at life. Here's a small/ very rough/ beginning stage/ look at what I'm thinking for the first design. 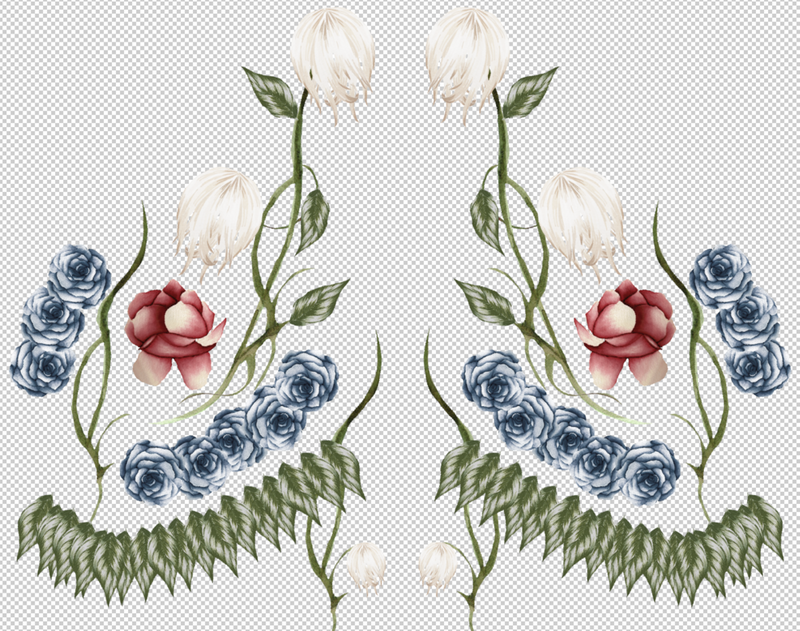 I'm using the CKD signature blue rose, flowers from Collection N 33 and leaves from Collection N 25. CKD will be making her rugs with Weaver & Loom, a brilliant bespoke rug company producing only hand made quality. Ali is taking me under his wing and throughout the design process will be teaching me true rug making. The rug world is vast. This is the reason why I haven't experimented with rugs until now. I would have fallen into the trap of only dealing with agents rather than the mills themselves. You need to know what your using in order to create good work. It's sort of like buying a suit with terrible fabric. I could come up with the best pattern, but if the quality isn't there it's just a really bad suit. There are like 50 different wools, and 1000's of weaves. Ali is teaching me what weaves should be used according to the use. There are certain wools that should only be used in hotter climates, and yarns that I haven't even heard about. Ali's vision is to push the boundaries in the industry, and I don't know what I did to get so lucky to be taught by him. I'm excited for this new phase in CKD. Bring on the rugs!